Roast the habanero(s) over a flame or in a skillet set over medium heat until the skin blisters and blackens a bit and the chile softens. Remove from heat. The best way to cut up a mango is to cut it vertically in almost the middle of the mango, just passing the blade of the knife by the large, flat pit. Do the same on the other side of the mango. Then gently slice the mango halves like you would an avocado, being careful not tu cut all the way through the skin. Use a spoon to scoop out the fruit into a blender. 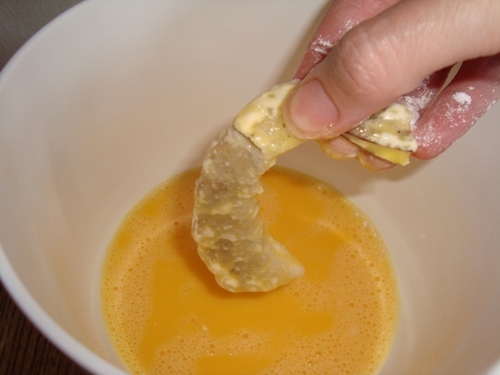 Peel the remaining piece of mango containing the pit and cut off as much fruit from the pit as you can and place the fruit in the blender. Repeat with the remaining mangoes. Add the habanero(s), ginger, and lime juice to the blender. Combine the ingredients until smooth. Pour into a medium saucepan, cover, and set over medium-low heat. Allow to simmer, but be carefull because mango spatters! 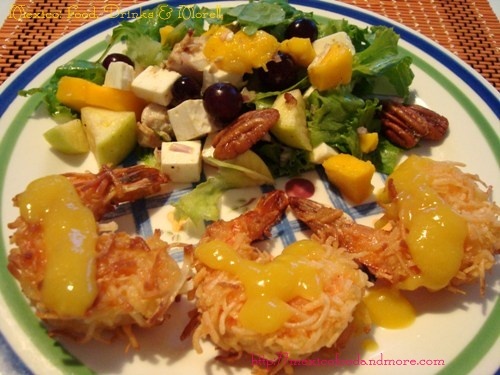 Keep the sauce warm while you prepare the coconut prawns. Note: This is enough sauce to serve with 24 coconut prawns. If I’m just making 12 prawns, I like to make the same amount of sauce and use the remaining sauce to marinate and roast a pork tenderloin another day. Shell, de-vein, and butterfly prawns, leaving tail intact. 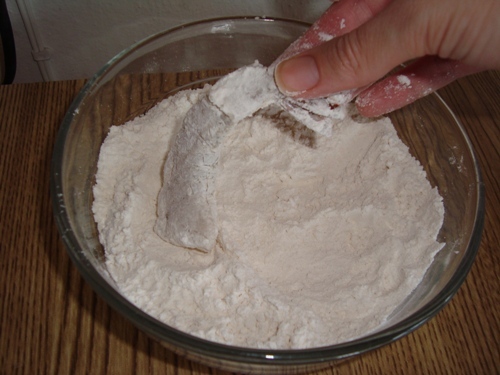 Combine flour, salt and sugar in a bowl and set aside. Beat eggs and milk together in a bowl and set aside. 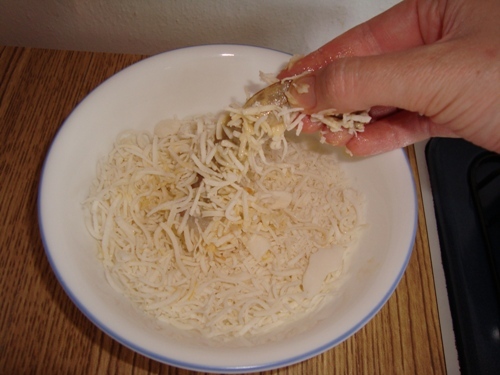 Place coconut in another bowl. 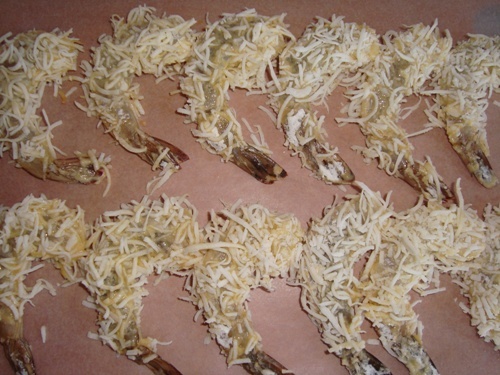 Holding each prawn by the tail, dip it in the flour mixture and shake off any excess. Next, dip it in the egg mixture. Finally, press it into the coconut, coating thoroughly. Set a large skillet over medium-high heat and add enough oil so it’s sufficiently deep to fry the prawns. When the oil is hot, add half the prawns. Fry until golden on both sides, between 1-3 minutes. Be careful not to overcook them. 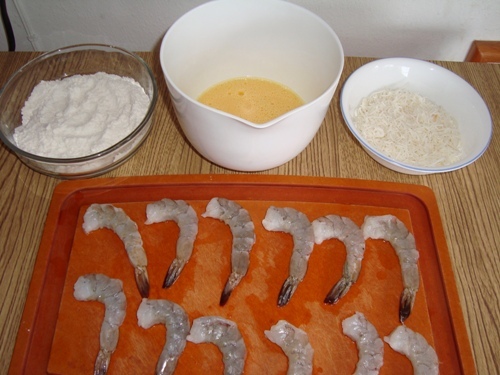 Transfer them to a paper-towel lined plate and repeat the process with the remaining prawns. Serve hot with mango lime habanero sauce. This entry is filed under Seafood. You can follow any responses to this entry through the RSS 2.0 feed. You can leave a response, or trackback from your own site.